To outsiders, Dambrath seems a land of contrasts. Its people dwell in open grasslands under a sweltering sun and endless blue sky, but they owe fealty to the drow, who shun the light. Though the majority of its population is human, Dambrath is ruled by the Crinti - people of mixed human, drow, and elf heritage. The nation draws its most lucrative trade commodities from both the land and the sea. Because of its leaders' surprisingly non-aggressive policies toward their neighbors and their aversion to allowing outsiders too far inside the nation's borders, Dambrath has remained a lard of mystery to most of Faerûn's folk. That situation suits its noble class just fine. Stretching between the East Wall, which serves as its border with Halruaa to the west, and the Southern Lluirwood to the east, the nation of Dambrath measures more than 700 miles across. Its coastline is nearly twice that long because of the way the Bay of Dancing Dolphins doubles back inland. From the coast, the land stretches about W0 miles north to the Forest of Amtar. 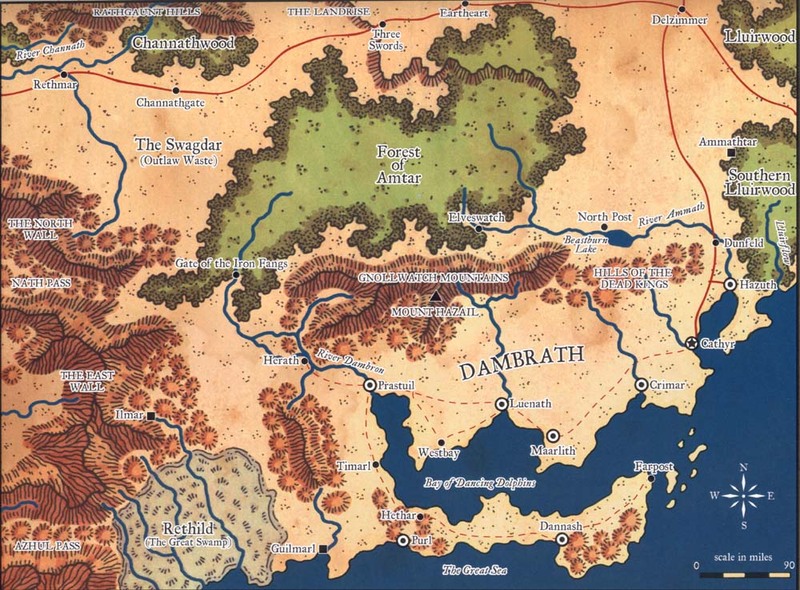 Most of Dambrath's inhabited land, however, lies south of the Gnollwatch Mountains and the Hills of the Dead Kings, which divide the nation into northern and southern regions. Dambrath also claims some additional land east of the Forest of Amtar, along the trade road toward Delzimmer. Rethild, also known as the Great Swamp, is ostensibly part of Dambrath, though its rulers claim that area in name only, since the lizardfolk and nagas that live there deter any thoughts of true control. Dambrath's climate is oppressively hot except during the rainy season, which begins in mid-Uktar and lasts two to three months. South of the Gnollwatch range, the days are sweltering, but the nights are pleasant because the breezes blowing in off the Great Sea cool the air quickly. North of.the mountains, the temperatures are even hotter, and the air is stiflingly sticky. Rain comes much more frequently there, making the Forest of Amtar a humid zone every bit as muggy as the jungle regions of the Chultan Peninsula. Most people dwelling in the countryside have never seen snow, and morning frosts are almost nonexistent except in the mountains. Most of Dambrath's land consists of open plains covered with tall grasses particularly suited for the breeding of horses. This veritable sea of rolling plains stretches as far as the eye can see in every direction. Horse ranches - tiny, self-sufficient communities dedicated to breeding the finest mounts in Faerûn - dot the countryside every few miles. Most of the urban population dwells in trading cities on the coast, particularly along the shores of the Bay of Dancing Dolphins. The crystal-clear waters of the bay keep Dambrath's fishing and pearl-diving industries lucrative year-round. Dambrath has two distinct geographies: the coastline around the Bay of Dancing Dolphins and the inland plains north of the Gnollwatch Mountains. The inhabitants perceive every other major geographic feature as little more than inconvenient wasteland bordering on the inhabited areas. "Stay out of the wilderness's way, and the wilderness will stay out of your way," as the Dambrathans are fond of saying. The sheltered body of water known as the Bay of Dancing Dolphins is more than 300 miles long. It stretches across most of Dambrath's central coastline, shielding the nation's interior from the harsher weather of the Great Sea. The bay is a key factor in the Dambrathan economy because it teems with both pearl-bearing oysters and a wide variety of fish. Fishermen all along the coast fill their nets each day with swordfish, snapper, sea bass, and other fish, most of which are sold locally to stock the larders of Dambrath's citizens. All along the shoals near the coast, the pearl divers work oyster beds that are visible dozens of feet below the surface because of the clarity of the water. Merchant vessels sailing to and from the harbors of Dambrath's various port Cities form a steady stream of traffic on the bay - and make choice targets for the noble-financed corsairs who frequent these waters. The waters of the bay are almost unnaturally calm, giving rise to rumors that some kind of subtle magic protects it from storms. Indeed, no storm has churned its waters for at least the last 500 years, though many stretches of coastline nearby have been repeatedly battered by winds and rain. Indeed, the captains of the many ships that frequent the bay have learned not to venture out beyond its mouth when the dolphin population grows noticeably more crowded. The creatures seem to sense when a storm is imminent and gather in the bay a day or two beforehand for shelter. Even during calm weather, the many schools of dolphins that call the bay home are by far its most prominent, visible, and impressive features. Each day at dusk, thousands of dolphins all along the bay engage in a playful, apparently coordinated "dance" or game. Locals often come down to the shores or board open-decked vessels and venture out onto the waters to watch the dancing dolphins. In addition to their entertainment value and their beauty, these dolphins are valued as a defense against aquatic hazards. In addition to predicting foul weather by their behavior, they have eliminated almost all predatory creatures - including sharks, giant squids, and sahuagin - from the bay. They have also aided drowning swimmers (including a queen who ruled Dambrath more than 300 years ago, on numerous occasions. Because of their uncanny ability to protect the bay, dolphins are revered and protected in Dambrath. Anyone caught harming one suffers extraordinarily painful punishment at the hands of Loviatar's priestesses. Various sages have attempted to study the dolphins and to discover what, if any, weather-controlling dweomer protects the bay. A few have discerned a faint and scattered emanation of magic, but no one has thus far determined its origins or effects. Several sages have theorized that the source of the bay's protective magic is some greater intelligence that dwells beneath the surface of the water, and that this being has also somehow organized and trained the dolphins. Indeed, legends have persisted for many years about a sunken city in the middle of the bay. Many sailors have reported seeing the tops of spires in the water when the sun shines down from directly overhead, illuminating the crystal-clear depths. But such claims never indicate the same location twice, and follow-up visits to search for the fabled city invariably turn up nothing. Some believe that the city is a remnant of a long-forgotten empire that once sat on dry land, and that magic gone awry submerged the city, creating the bay in the process. Others argue that the sunken city is the home of a sinister seafaring race whose members are biding their time until they can attack the shores of Dambrath. In this version of the tale, the dolphins are allies of the undersea dwellers, performing their dance and saving drowning swimmers just to lull the surface dwellers into a false sense of security. The truth is somewhere in between. A hidden city does exist at the bottom of the Bay of Dancing Dolphins, and its inhabitants are tritons. These outsiders were quite friendly with the Arkaiun tribes that once occupied the coast of Dambrath, and the two races traded occasionally. Even then, however, the tritons kept the existence of their city a secret, preferring to venture close to the shore in small groups to deal with the humans. Several centuries ago, a dispute over the value of pearls caused the tritons to withdraw, and the human tribes eventually forgot about them. By the time the drow overran the surface and conquered the Arkaiuns, the tritons were no longer even a legend. The tritons keep the existence of their city secret through potent magic worked by a circle of powerful clerics dedicated to their own deity. The magic hides the walls and spires of their city by simple displacement - that is, the structures appear to be at various other spots in the depths of the bay. The triton clerics are also responsible for the perpetually calm weather in the bay, and the dolphins are indeed their friends and allies. A portal in the heart of the triton city leads to the Elemental Plane of Water. The Forest of Amtar is a lush, humid, near-tropical woodland. Dense tangles of suthwood stretch for miles, forming natural barriers at various locations throughout the forest. Vast stretches of shadowtops and slightly shorter pines fill the gaps between the suth tangles, and thick vines, ivy, and brambles form the understory, sometimes even climbing the trunks of the trees. Though little direct sunlight reaches beneath the boughs that form the forest canopy, the rainy climate and tropical location keep the interior damp and hot, making the Amtar a perfect haven for endless swarms of crawling and flying insects. The Amtar is also home to many kinds of wild animals. Parrots, macaws, and other tropical birds nest in its trees, and lizards and snakes of all sorts slither through the undergrowth. Mammals native to the forest include wild boars and dangerous predators such as tigers and leopards. Families of monkeys and gorillas roam the woodland, but their populations are more concentrated in the northern half. Travelers must be wary of more than just the normal animals, however. Giant snakes, lizards, and beetles also prowl the deepest sections of the forest, and a few girallons and dire apes lead wandering packs. A tribe of wild elves known as the Trunadar, or "star people," calls the southern half of the Amtar home. The tribe, which numbers no more than five hundred adults, takes advantage of the relative protection offered by the Gnollwatch Mountains to the south, which serve as an additional screen against the predations of the Dambrathans. The Trunadar roam the central part of the southern forest, steering clear of both the community of Elveswatch on the east side and the ruin known as the Gate of Iron Fangs on the west. The tribe's nominal leader, Ferla Treerunner (CG male wild elf barbarian 8/sorcerer 6), occasionally sends a raiding party to disrupt logging on the edge of the forest near the community of Elveswatch. Just as occasionally, the Crinti rulers of Dambrath send a force of soldiers into the forest to scare. the wild elves away. Neither side, however, is willing to engage in any true warfare on the other's home turf. Several small bandit groups use the concealing growth to hide from pursuit, and some have staked out areas along the edges of the forest as temporary bases. These latter groups usually hide out along the northern boundary of the woods, preying on the caravan traffic that moves along the road between Rethmar and Delzimmer. A few take refuge in the eastern stretches of the Amtar and range out toward the Trader's Way. The thick, tangled woods make pursuit difficult at best, since the bandits always know the paths through the endless stretches of suthwood much better than their pursuers do. Tandith Tornears (LE male ogre mage barbarian 5) leads one such group of raiders - a motley collection of humans and half-orcs augmented by a couple of ogres. Tandith and his minions prowl the stretch of woods along the road between Channathgate and the Landrise. There the forest's edge comes right up to the route, making ambushes easier. Folk from Three Swords have tried in vain for several years to catch Tandith's band, but they have never succeeded. They have recently petitioned the Great Rift for aid, since a substantial portion of the goods stolen in these raids was either heading toward or coming from the gold dwarves. The leaders there are presently considering a course of action. An ancient city, its origins lost in the mists of time, stands at the southwestern tip of the Forest of Amtar. Only a few of its stones still stand, and creepers and vines have wormed their way over and through every remnant of the city's previous glory. Named for the oddly curved and menacing towers that flank what is left of the main gate, the Gate of Iron Fangs was already a crumbling ruin by the time the Arkaiuns migrated to this region. Those few who have studied the city's remains in detail speculate that it was founded by the same culture that constructed Ilimar to the south, based on the similarity of the architecture and the gate's resemblance to a pair of serpentine fangs. Whatever its origins, however, most sensible folk avoid the place because of the dangerous creatures that call it home. A large tribe of gnolls has claimed the site as its own and now uses it as a base from which to raid south and east into the ranch country of Dambrath, and north toward Channathgate and Rethmar. These gnolls are much better organized than others of their kind, somehow managing to strike key locations and particularly wealthy caravans each time they raid. Most victims of their predations believe that the gnolls are working in concert with the outlaws of the Swagdar, but the truth is far more sinister. Several years ago, a glabrezu tanar'ri named Quinix found his way through a partially functioning portal from the Abyss into the subterranean levels of the city. The demon quickly gained the loyalty of the gnolls via a complex web of lies liberally spiced with bribery. As a result, the gnolls now believe that Quinix is a direct representative of Yeenoghu and that his presence is proof that they are the deity's favored servants. Qginix has since used the erratically functioning portal to bring in a pair of vrocks, which serve as his assistants and bodyguards. The glabrezu now sits deep within the bowels of the ruined city, plotting ways to bring chaos and evil upon the surrounding lands. The Gnollwatch Mountains run east and west for about 275 miles in the northern half of Dambrath, eventually giving way to the Hills of the Dead Kings to the east. The Gnollwatches are not particularly tall - most peaks barely reach 9,000 feet, and Mount Hazail, the highest point in the range, tops out at 11,112 feet. Still, since the majority of Dambrath is so close to sea level, the range presents a striking contrast to the rolling plains just south of it. The Gnollwatch Mountains wear a mantle of light snow for about five months out of the year, most of it falling during the winter rainy season. The rest of the time, the copses of pine, shadowtop, and suthwood that dot the slopes appear as spots of dark green against the tan mountain meadows, which are dominated by short, coarse grasses similar to those on the plains below. Above the timberline, more of this brown grass covers the mountains, smooth, rounded domes. Unlike some of the more craggy ranges in other parts of Faerûn, the Gnollwatch Mountains have been worn down over millennia by the daily rainstorms that build along the slopes and the incessant sea breezes that blow from the south. True to their name, the Gnollwatches are home to numerous tribes of gnolls that dwell in cave complexes scattered along their wooded slopes. For the most part, the Dambrathans living near the foothills consider the gnolls an aggravation because they are aggressive, hostile, and a drain on the area's resources. However, the few gnoll tribes that have consolidated under Grubash Blacksnout (LE male gnoll fighter 6), a particularly disciplined leader, have actually managed to maintain cordial relations with their human and Crinti counterparts. Grubash coordinates hunting territories to minimize conflicts, and he has arranged for gnolls to serve as mercenaries for the Dambrathan nobility. In exchange for generous supplies of meat and silver trinkets, gnoll mercenaries battle other gnoll tribes on behalf of powerful ranch owners and occasionally attack ranches owned by their 'employers' rivals. A single family of storm giants maintains a well-hidden castle in a particularly remote and sheltered crag near the highest peaks of the Gnollwatches. Abinor Lashingwind (CG male storm giant sorcerer 7), the head of the family, takes great pains to keep his household hidden from the prying eyes of both the Dambrathans in the plains and the drow below them. The hill giants know about their rivals but leave them alone, seeing no good reason to incur the larger giants' wrath. To warn off unwanted intruders of other races, Abinor has taken to creating "evidence" of an immense, cranky silver dragon that dwells high in the peaks, and rumors of this fictitious beast have spread all the way to the coast and into neighboring Luiren. A number of rich silver deposits snake through the Gnollwatch Mountains, and miners discover more new bodes every year. The Dambrathans have made themselves wealthy digging the ore from the earth, and they 'have actively prospected all through the mountains, despite the danger from monsters and outlaws. Some of the larger mining consortiums hire competing mining operations - and even less friendly gnoll tribes - to work their claims, thus ensuring maximum yield with minimum danger. The drow city of T'lindhet sits squarely beneath the Gnollwatch Mountains, several miles below the surface. Unlike most connections between the Underdark and the world above, the road from Dambrath into the bowels of the earth is an open trade route, since the drow have laid at least a nominal claim to the lands of their surface counterparts. The main road connecting the two regions winds out of Herath into the southern foothills along the far western end of the range, where it enters a broad cave. From there, the path descends through worked tunnels to the drow community. Numerous smaller roads join the route from other surface entrances, but since the drow do not use these secondary paths as regular thoroughfares, they make no effort to keep them predator-free. This region of gently sloping, grass-covered knolls was once known simply as the Hills of the Kings. Its name changed when the Arkaiuns were conquered by the drow and their unexpected allies, the priestesses of Loviatar (see History of Dambrath, below). Despite their somewhat moribund name, the hills are pleasant and relatively danger-free, except when the hill giants from the mountains to the west wander this way. Scattered copses of pines and the occasional shadowtop dot the grassy rises here and there, but trees are rare in these hills. Numerous streams meander through the meadows toward the flatter plains to the south and east. A number of halflings dwell at the eastern end of the Hills of the Dead Kings. Most of these hin are stronghearts who migrated west from the Southern Lluirwood and eventually found themselves beyond the borders of their native Luiren. The halflings keep to themselves, living in small hamlets and villages throughout the hilly region. The hin rarely leave their domain, though they do maintain trade relations with the Dambrathans to the southwest. They are also more than willing to trade with any merchants who deem it worth their while to detour off the route between Cathyr and Delaimmer. The hills got their name because the old Arkaiun tribe that had settled the region (see History of Dambrath) preferred to bury its kings in remote tombs. Of the nine Arkaiun monarchs who reigned in Dambrath, seven are reputedly entombed in secret vaults deep in these hills. Only Reinhar I, who died in battle in Halruaa, and Reinhar IX, who was slain during the battle with the drow of T'lindhet, did not receive such honorable resting places. Even so, at the command of Malar the Beastlord, the Arkaiuns constructed an empty burial chamber in honor of Reinhar I, filling it with treasures and setting numerous guards and wards to protect it. According to legend, Malar also presented the Arkaiuns with two magic constructs - a stone lion and an iron tiger - to serve as guardians inside this tomb. The Arkaiun people of Dambrath (now called Shebali by their Crinti rulers) proudly claim that the tombs of their dead forbears have never been found or plundered. In truth, however, Crinti adventurers have sacked several of them. The Crinti wisely keep this tidbit of information to themselves, for fear of causing an uprising among the Shebali. The tomb robbers have carefully smuggled whatever wonders they have found to other parts of the world, where they could reap tidy profits from them. Still, several of the tombs lie undiscovered - no doubt protected by the ancient magic of the Arkaiun builders. The Great Swamp of Rethild pools around the base of Halruaa's East Wall, which marks the western border of Dambrath. The southern edge of the swamp gradually grows wetter and the ground less firm as it fades into the ocean. The swamp is a sweltering place filled with moss-covered cypress and zalantar trees, as well as countless horrors waiting to prey on the unwary. Few choose to venture into it, and fewer still return from its murky interior. The air in the Great Swamp is hot, sticky, and foul-smelling. Most of the year, the combination of high temperatures, wretched humidity, and endless clouds of swarming, biting insects creates an oppressive environment that few creatures not native to the place can tolerate for more than a couple of hours. Even during the rainy season, when the temperature cools a few degrees, the place is still a bug-infested, sweltering steam bath. Deaths result as often from exhaustion, sickness, and overheating as from the dangerous creatures that abound here. The noxious vapors that bubble up through the water are the products of decomposing matter, monstrous exudations, and residual magic left here long ago. These odious fumes form steaming clouds of pale yellow, brown, or green gas that hug the ground and drift slowly along through the trees, driven by the sluggish breezes. Some of these clouds are deadly, carrying poisons such as burnt othur fumes or diseases such as cackle fever and mindfire through the swamp. The Great Swamp is home to numerous unusual creatures, including giant versions of leeches, toads, and snakes, tribes of bullywugs and tasloi, and the occasional shambling mound. In addition, rumors abound of yet another inhabitant - a black dragon named Valraxaxath that dwells in a ruined city at the heart of the swamp. These rumors are true, but the dragon hasn't been seen in almost sixty years, since it prefers to hunt far afield by means of a portal network. The name of the lost city where it lairs is unknown, but legend holds that it was constructed by the same race that built Ilimar, and possibly Chasolné as well. By far the most numerous denizens of the swamp are the lizardfolk tribes, which have united into the kingdom of Kethid under Ghassis (GE male half-fiend lizardfolk Sor15). Not content simply to rule his kingdom, King Ghassis has taken an interest in both the wonders and the politics of the world beyond the Great Swamp. Under the leadership of his field commander Sladdis (GE male lizardfolk Ftr12), Ghassis dispatches companies of lizardfolk mercenaries, known collectively as the Servants of the Royal Egg, to fight in distant wars. Members of this company exhibit plenty of single-minded determination and an intense sense of group identity, so they are valued for their prowess in head-to-head combat. Their lack of initiative and poor tactical sense, however, means that strong leadership and explicit instructions are vital in achieving the desired results. For the most part, Ghassis is indifferent to the fate of these mercenaries. The king of the lizardfolk is far more interested in the wealth he can accumulate from potential employers than in seeing his subjects return safely home after an engagement. He has no qualms about sending the Servants of the Royal Egg on dangerous assignments from which they are unlikely to return, though he does expect an especially lucrative deal for committing them to their deaths. In recent years, he has dedicated several companies of the Servants of the Royal Egg to Tethyr's War of Reclamation, and a few to limited fighting in the Jungles of Chult. Despite the popularity of lizardfolk mercenaries elsewhere, the folk of Dambrath rarely call upon them to serve in battle against their enemies. Because most of the nation's strife is internal, foes have plenty of opportunity to offer Ghassis a better deal - and the Dambrathans know that he might order his minions to change sides during a fight for enough cash. Possibly as payment for the services of the Servants of the Royal Egg, or perhaps simply through trickery or cunning, Ghassis has acquired three Halru'aan skyships. Though his own subjects know about the flying vessels, the king tries to keep their existence a secret from the rest of the world. Most of the time, they are hidden deep inside the swamp under camouflage. However, King Ghassis uses them to travel the length and breadth of his kingdom from time to time, or to deliver mercenaries to the battlefield on rare occasions. Now and then, folk beyond the borders of the swamp see the lights of the skyships as they rise into the night. Such sightings have sparked rumors about lights dancing in the skies over the Great Swamp, though speculation about their origins is as wild and as varied as the people who have seen them. Few guesses have actually come close to the truth. Ilimar is a split city, divided between the two ends of a portal. Now crumbling ruins, these two sites are all that remains of a city founded millennia ago by the sarrukh, the progenitor race that created most of Faerûn's intelligent lizard and serpent creatures, including nagas, yuan-ti, and lizardfolk. The southern half of Ilimar lies nestled in the hills, near the headwaters of one of the streams that feeds the Great Swamp from the north. The northern half lies in the western reaches of the Gulthmere Forest, near the southern shore of the Lake of the Long Arm. A sacred site to the lizardfolk of Rethild, the southern portion of Ilimar is ruled by a circle of spirit nagas, whom the lizardfolk worship as deities. These nagas know that three sarrukh lie in hibernation somewhere beneath the center of southern Ilimar. The sarrukh took great pains to ensure that they were well hidden from potential threats, so the nagas don't know precisely where they are. However, they can sense the presence of their creators, and they plan to be ready when their masters emerge from the depths of the ruins. The spirit nagas use the lizardfolk as a labor force to hunt for other lost sites from the time of the sarrukh. Upon finding such a ruin, they excavate it for valuable artifacts that once belonged to their creators, hoping to offer these baubles as tokens of their continued fealty when their masters return. The nagas have already discovered a few such sites, including the ruins of Chasolné throughout the East Wall and the swamp. The wasteland known as the Swagdar stretches from the foothills of the East Wall to the fringes of the territory patrolled by Herath's military, and from the northern edge of the Great Swamp to the southern boundary of the Forest of Amtar. For decades, the Swagdar has been a haven for anyone who refused to bow down to the Crinti who rule Dambrath. Bandits, thieves, and Shebali who escaped the rule of the Crinti roam this wide-open countryside, embracing an almost nomadic lifestyle. With no single charismatic leader to unite them, the various tribes scuffle among themselves almost as much as they do with the Dambrathans. For the people of this lawless region, however, the sort of dangerous freedom the Swagdar offers is better than a life of subjugation. Many of those who come to the Swagdar are criminals fleeing their pasts - or seeking a place where they can continue their depredations outside the watchful eye of the law. Others are loners who prefer the solitary nature of the countryside to the more heavily settled plains of Dambrath proper. Still others, claiming to be descendants of the original Arkaiuns, come here to defy the overbearing Crinti and return to their ancestors' way of life. These wanderers typically worship the Beastlord, as their forebears did centuries ago. When the bandit raids grow intolerable, the Crinti send expeditionary forces into the Swagdar to conquer or drive off the occupants. Thus far, their successes have been marginal at best, since the nomadic people of the Swagdat can scatter at a moment's notice and hide in the hills, forest, or swamp. Once the Crinti tire of chasing dust trails and return to their civilized lands, the tribes drift back and take up where they left off. Though the tribes of the Swagdar range freely over the wasteland's open ground, they make a point of avoiding ruins such as Ilimar and the Gate of Iron Fangs. More than a few bandits whose curiosity got the better of them have disappeared in those places, and the locals share cautionary tales over communal campfires with all new residents and travelers. However, they gleefully urge any self-assured adventurers passing through the area to seek their fortunes in such places.